Adjust the oven rack to the middle position and preheat oven to 425 degrees f. Place the sausages on a large, rimmed baking sheet. Using a sharp paring knife, poke a few holes in the sausages to help steam escape and keep the sausages from bursting. Drizzle with 1 T. of the olive oil, toss to coat. Roast the sausages until cooked through to an internal temp. of 160 degrees f. about 30 minutes, flipping the sausages over halfway through cooking time. (Keep in mind that different sausages can take different amounts of time to be thoroughly cooked through, depending on their size.) Remove from oven, cover with foil to keep warm. Heat the remaining 3 T. oil and garlic in a large skillet over medium-low heat. Cook the garlic in the oil until the garlic is sticky and straw-colored, 7-10 minutes. (If the garlic starts to brown too quickly, reduce the heat to low, the key here is low and slow.) Remove the garlic to a small bowl, reserving the oil in the skillet. Increase the heat to medium-high, add the red onion, chard stems and 1/4 t. salt. Cook, stirring occasionally until tender and browned around the edges, about 10-15 minutes. Remove to a clean bowl. Reduce the heat to medium. Add the chard leaves and cranberries, cook for about 5 minutes, until the greens are wilted down. Add the browned onion and chard stems, cook together until almost all the liquid in the skillet has evaporated, about another 5 minutes. Off heat add 1 T. butter, stir into the chard, season to taste with salt & pepper, adding the balsamic vinegar to taste. For the polenta: In a heavy bottomed saucepan with at least a 4-qt. capcity, bring the water and milk to a boil. Reduce the heat to the lowest possible setting, slowly add in the polenta, whisking constantly, add 1 t. salt. Cover the saucepan and continue to cook on low heat, stirring well every few minutes, until the polenta is tender and looses it's raw taste, about 30 minutes total. Off heat, add the remaining 2 T. butter, stirring until melted. Add the cheeses, a handful at a time, stirring until combined. 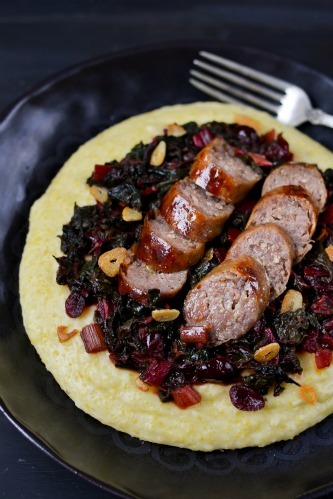 Serve the sauteed chard and sausages over the polenta, garnished with the toasted garlic. 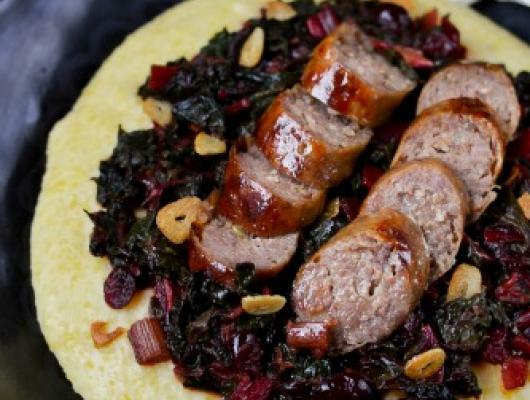 Festively colored sauteed red chard and cranberries, with roasted sausages, served over cheesy, creamy four cheese polenta.